The 1st 2-in-1 tinted dermatological treatment that biologically conceals and eliminates blemishes. For acne prone skin. Can be used on the face by adults and teens. Use everyday, morning and during the day. 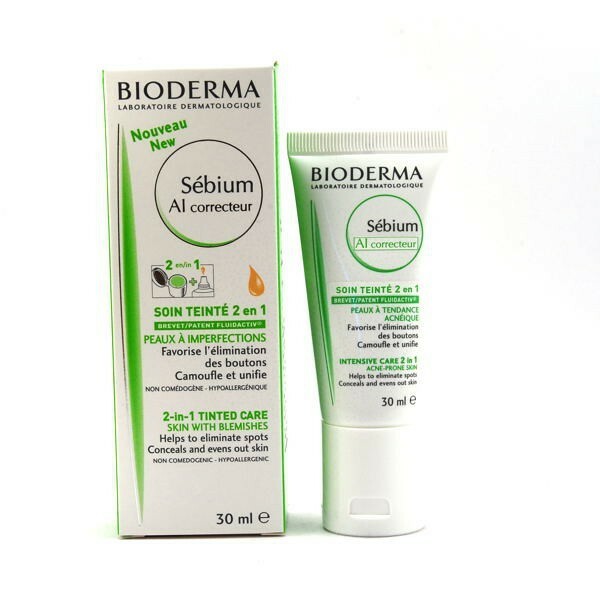 Use Sébium AI Correcteur on your skin after cleansing. First apply a small amount of green corrector found inside the cap on your pimples. Then unscrew the top and spread the tinted cream all over your face. Taking advantage of the latest dermatological breakthroughs, Sébium AI Correcteur promotes the elimination of pimples through multi-targeted action and brightens the complexion thanks to its natural coloring. The Fluidactiv exclusive patented complex helps neutralise the bacterium responsible for inflammation, soothes redness and limits the appearance of pimples, as well as, biologically regulates sebum quality and keeps pores from becoming clogged to limit the formation of blackheads. Zinc gluconate, combined with enoxolone and a lipase inhibitor, limits the proliferation of P. acnes, the bacterium responsible for the inflammation that causes pimples, soothes redness and relieves irritation. Sébium AI correcteur thus prevents scarring risks since inflammation is correlated with the risk of scars. Zinc gluconate reduces shine.